Evolight is the new Naviop revolution: a new product, fully scalable, to provide small size boats with a monitoring and control system that can be essential, reliable and cheap.. 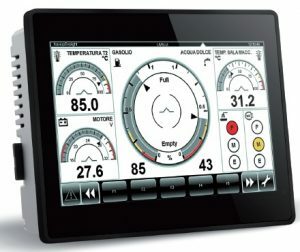 The NAVIOP EVOLIGHT ready-made solution enables to integrate and monitor almost all on-board controls in only one display that can be flush mounted into the boat dashboard with no protruding bezel, buttons or knobs, giving the boat a modern and sophisticated character through an elegant and essential design. VERSIONE 1: Page Flap, Trim, helm angle data, page levels with alarms, page tensions 12/24 VDC with alarms, page alarms. VERSIONE 2: Page temperatures monitoring, page levels with alarms, page tensions 12/24 VDC with alarms, page alarms. Thanks to the easiness of installation and use and the high strength of a technology specifically designed for marine environment, Evolight is the best system to automate controls and safety on small boats, equipping them with one of the most modern and cutting edge solutions. For further technical information on the Evolight Ready-made solution, please refer to the technical data sheets.